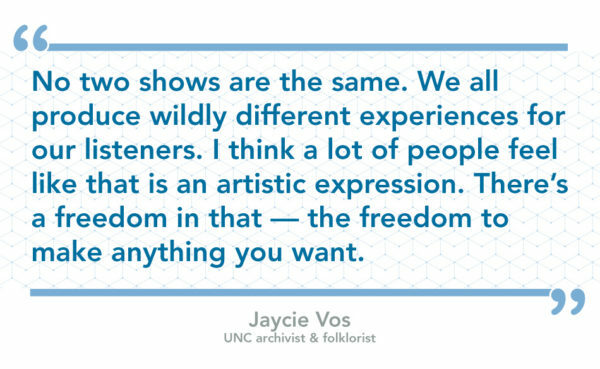 The experimental environment at WXDU provides an artistic haven for Duke University students and Durham locals alike — a sentiment that UNC archivist and folklorist Jaycie Vos hopes to capture. UNC graduate student Jaycie Vos has been a DJ at WXDU since May 2016. Her show airs every Sunday night at 8 p.m. In 1996, on a warm summer evening in small-town Iowa, the sound of an electric rhythm guitar siphons through the speakers of a 1980s Sounddesign stereo. Seven-year-old Jaycie Vos and her dad lounge on lawn chairs in the driveway, sipping on root beer. Her father shares musical memories from the evening’s playlist — the most popular disco songs of the ’70s on rotation at the local Des Moines station, Star 102.5. The stillness of this Saturday night ritual is only broken when Vos heads inside to call in a request: “Funkytown” by Lipps Inc.
Folklore focuses on the creative endeavors that fill communities with meaning — “everything from quilt-making to hip-hop free-styling,” according to the Department of American Studies’ website. To study it requires an ethnographic approach, meaning to immerse yourself into a specific group of people, to become a part of their society, to be a part of something greater than yourself. And the college radio environment is the epitome of that sentiment, according to Vos. 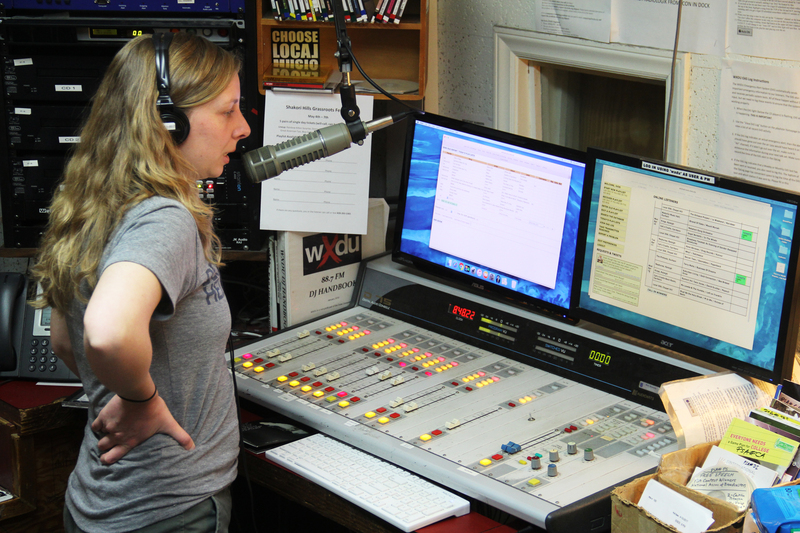 Unlike other college radio stations, WXDU allows community members to DJ. At least half of the 100-plus-person staff is comprised of people who didn’t attend Duke and range in age from 20 to 50 years old. When Vos isn’t laying down tracks — or catching live acts at one of Chapel Hill or Durham’s many music haunts — she can be found at the Love House on Franklin Street. A UNC-trained archivist, she documents community histories for the Southern Oral History Program. Her passion for preserving the past translates well in the folklore program and, particularly, this project. 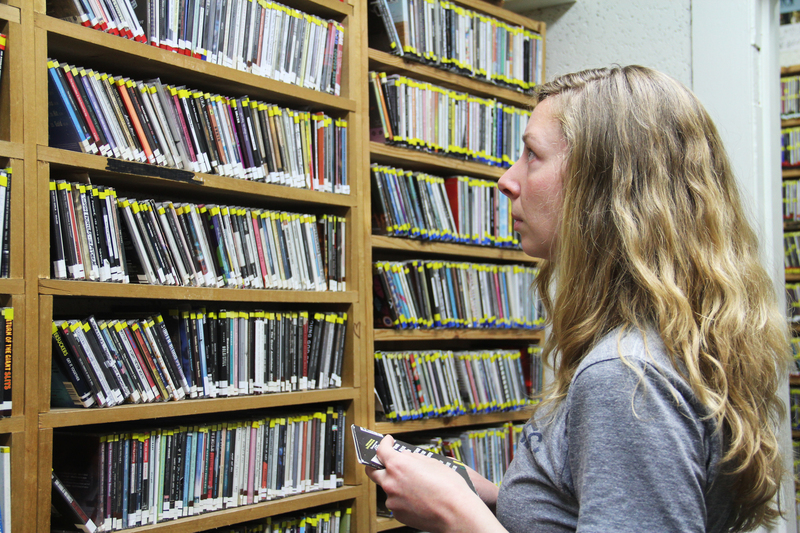 “The big advantage of being an archivist is the active awareness that what I’m doing can be shared with others to capture and preserve what WXDU means in 2017,” she says. Many of the DJs at the station recognize the value of an in-house archive with audio recordings of interviews, photographs, and written text in the form of Vos’ thesis. Vos selects music from the WXDU library, comprised of shelf upon shelf of content that winds in and out of several rooms. The new location will be within the 71,000-square-foot Arts Center that’s currently under construction across from the Nasher Museum. It will be ADA compliant and feature a state-of-the-art production room that will make in-studio interviews possible. Unlike the current space, the music library will be located outside the production room and will showcase the CDs in clean cases with rolling Plexiglas doors. Jaycie Vos is a graduate student majoring in folklore within the UNC College of Arts and Sciences’ Department of American Studies, as well as an alumnus of the UNC School of Information and Library Science. She is also the coordinator of collections for the Southern Oral History Program, which has conducted more than 6,000 interviews to preserve the history of the South since 1973.